Good afternoon, everybody, and welcome to the 2017 Farm Show. Our 101st Farm Show and we are very proud to host you here as we start a new century of Farm Show here with this show. So thank you for being here. A special note of thanks to the members of the General Assembly who are here, we very much appreciate the work that you do throughout the year, what you do to support agriculture, and certainly look forward to the work here in this new session, so to each of you, thank you for being here. On behalf of the Farm Show Commission and all of the members of the Department of Agriculture, a special welcome to you, it’s very nice of you to take time to be here, particularly when the morning may have been a little slippery in spots across this Commonwealth. So, thank you for being here. This year, as we begin a new century of Farm Show, we thought it was appropriate to use the backdrop of “Our Commonwealth’s Blue Ribbon Experience,” to really talk about both the bounty and certainly, the people of the industry and celebrate that as we do throughout the week. But we also wanted to take it a step further, and thought as we look at the future of agriculture that really is what we are here to celebrate. We talk about history but we understand that it is about the future and what happens here both this week and in the next year, in the very short term. But obviously the long-term is very important to the future of agriculture and the future of this Commonwealth, so we thought it would be appropriate to take a moment during this important Public Officials Day with you as our key partners in this address to engage you, to talk about it. And I’ll sort of give you the forecast in this presentation, but just to say that as we look at what we do in agriculture, this is not something that you can do solely as a Department or even solely as a state government. Right? It is about the partnership with each of you, and the piece that you hold is a key part in our success. So, what does the future of agriculture look like? It is bright in Pennsylvania. It is bright in America for agriculture. I’ll lay this out here this afternoon. But as Mike had mentioned in his opening comments, agriculture is shifting amidst a seemingly ever-changing landscape economically, socially, culturally, and politically. It is shifting in ways that, you know what, maybe we could have anticipated, but what is experienced over the last couple of years, I’m not sure that we could have anticipated the impact of technology, particularly some of the global influences of agriculture both in the U.S. and in Pennsylvania. These shifts and changes, in my opinion, create tremendous opportunity for us in an industry, and they are drivers behind our work at the department. And I want you to know that we have taken on this task of a strategic plan and they are drivers in that strategic plan as well. Many of you participated, as I look around, in the listening sessions we hosted related to the strategic planning process. I want to say thank you for doing that. And through these sessions, we were reminded just how diverse agriculture is across Pennsylvania, and it’s certainly on display this week. We are certainly diverse in terms of our outputs: 59,000 farms in the state; top five producer in the nation of more than 10 agricultural commodities; 2,300 food processing companies provide products for both this region of Pennsylvania, and around the world. We have thousands of allied industry businesses and organizations that rely on agriculture for their existence. But we are diverse in other ways, as well. We have agriculture sectors, such as the hardwoods industry, that date back to the founding of the Commonwealth, and newly burgeoning businesses such as aquaponics. We have farm operators that have been here for generations, and farmers that are brand new to the industry. We are a national leader in organic agriculture and remain a driver in the nation’s dairy business. We see traditional farms growing on our rooftops and vacant spaces, and we’re welcoming, increasing numbers of women and city dwellers to our family. This diversity is what gives us strength, we believe, as an industry, and strength as a Commonwealth. It will also help us ride out the tough markets and will help us shape the markets and guide our future. This diversity of thought and perspective is what is required to move agriculture, here in Pennsylvania and across the country, forward. We need that diverse thought. We need the perspective that each of you bring to the table. In reflecting on this diversity, it is important to remind all those who consider agriculture their business, their family heritage, their future and their passion, that they have a friend in the Department of Agriculture. The reality of the industry we are in and what we are doing is that it will take all of us to deliver on the needs of a growing world while ensuring that our efforts are reinforced in the communities that surround our farms and agribusinesses. Many of you here have heard me say that in agriculture, we are in the relationship business. The relationship between farmer and neighbor, the relationship between farmer and consumer, between those who produce and those who add value, and as demonstrated today, between the ag industry and public leaders. Our relationships will continue to define our success. Yet the more I think about it, the more I realize that we are also at critical intersections. Our industry is at an intersection with citizens in vital needs like food, clothing and shelter. Each and every day, multiple times of day, we impact the lives of Pennsylvanians – often without them realizing it. That is a primary intersection for agriculture, and is one that requires us to be great storytellers, to bring to life what we do and the commitment we have to our way of life and the business. However, we are also at an intersection on the natural resources front – caring for the land, the water, the air and the overall environment that we live within. It’s another storytelling opportunity because it isn’t always the way our industry is viewed. We choose to capture this intersection in the butter sculpture this year with the theme “The Culture of Stewardship.” This challenge is commensurate with the size of the industry, requiring us to rise to the task to ensure the future of our industry and showcase how agriculture will be the solution to some of these resource challenges when we begin adding two billion people to this planet. But, sometimes overlooked in conversations about agriculture is our role as an intersection in our communities. Increasingly, we see new neighborhoods benefit from agriculture. In our urban centers and cities, citizens are rediscovering the power of food to change lives. This is a success story on multiple fronts. They are creating productive, open space that community members can enjoy. There is locally grown food. Fresh food for neighbors. We’re seeing young people step into new careers, to learn new skills, experience in patience, and recognizing that the easiest day sometimes in agriculture, is the day you plant something. Everything that day after is work. That’s an important lesson. But they also learn about work ethic to succeed in agriculture. And these gardens and farms provide a critical sense of pride for those in these communities. There are many stories, from Extension, 4-H, FFA and local food banks and other partners that bring this narrative to life. And they are important reminders that whenever people eat and wherever they eat, agriculture is a cornerstone of their life. And at the heart of this tale of the intersections of agriculture is how interwoven it is to our rural communities. Our rural communities and the contributions they make form the very frame that supports the rest of Pennsylvania from agricultural production to energy and economic contributions. They are filled with people who can trace lineage back multiple generations and centuries, some that have hollows and peaks and lanes named for their ancestors, and those who have just arrived to pursue their passions and plant roots in a community that they have embraced. Having grown up in a rural area with a strong sense of place and history, I challenge all of us here today that part of our work must be to tell the story of our rural communities and the value they add to the complexion of Pennsylvania. This means better understanding the value of agriculture, in terms of a workforce and economic development, as an anchor for open space in many of the businesses of the state, at the heart of the number of chambers of commerce across the state, and as a potential new home for the young men and women and families that may have gone to other areas to work and come home for opportunity. Whether we are developing new farms in town or working to support our farms in the township, there is a group that is perhaps one of the most critical intersections of all, and that is each of you, our public and elected officials. All of you here today form the network and infrastructure that frames our agriculture industry. Your work, which is often quietly done behind the scenes and without fanfare, is incredibly important to our industry and to our commonwealth. Agriculture is dependent on many things: the state of trade relationships, the opportunities of new markets, adding value to products at the farm level and beyond, and the intellectual capital of farmers and the agriculturalists. At times, we don’t pay much attention to these variables, and at times we are very protective of the ones that benefit us individually the most. Yet the reality is that agriculture has grown to become an industry where futures markets and farmers markets are equally important to feeding a growing world. It means that we must have faith in each other and we must work together to create an industry and an environment that we want. What is happening globally will speak to what happens in Pennsylvania. We can wait to see what takes place or we can find ways to be an active player in feeding a population where more than half the humans on this planet are under the age of 30, including 90% of the population of emerging and developing nations. We will increasingly face a market full of dichotomies: the desire to grow, buy and promote local, alongside the recognition that 95% of the stomachs in this world are someplace other than the United States of America. I know well that agriculture has been incredibly good to us, and to the 12.7 million citizens who call Pennsylvania home. Agriculture is an important part of our heritage and history, but it is an even more critical part of our future. We must keep the myriad of stakeholders involved in our industry, including the customer and consumer, talking about the issues we face and the industry we want to take shape, because it’s very easy at times to sort of walk away from these conversations. Ladies and gentlemen, this is our prompt to take a broad view and stay engaged in the conversation. How each and every one of us in this room speaks about, represents, protects and grows Pennsylvania agriculture will define its future. This sounds easy. But in reality, it means a lot of work to build a shared vision and consensus. It means acknowledging that we are not in this alone, and building coalitions and communities to support agriculture as a whole. It is a collective challenge. It means getting beyond our own comfort zones of thinking about agriculture in one very personal dimension, confined to the world immediately around us by the jurisdictional boundaries that delineate the scope of our work. I experienced this first hand over the last six years as chair of the U.S. Department of Agriculture Biotechnology Advisory Committee on 21st Century Agriculture. This committee had a broad charge from Congress and from Secretary Vilsack, to look at the emerging interface issues of technology in crop production. Each of the 23 members thought that we knew agriculture, but after six years of trying to manage through some very complicated conversations about coexistence in different production practices, I, and I am sure many others, have an entirely new appreciation for the diversity of agriculture. It looks much different here in the Susquehanna Valley of Pennsylvania than it does in the San Joaquin Valley of California. Agriculture looks different, but the big issues were, by and large, the same. While this was a national conversation, we could just as easily say agriculture looks different in south-central Pennsylvania than it does in northwestern Pennsylvania. But the issues are the same. This experience was meaningful for all involved, because it forced everyone in the conversation about coexistence to focus on the “co-” and move beyond their own existence. My belief remains that there is room at and on the table for all of agriculture, and we will need every voice available to help us work on the big, audacious, wicked problems that we face both as a government, as a nation and as an industry. Yet I think the struggle to better understand and articulate the value of agriculture as a whole, has a very important reminder to all of us: while we struggle with systems, we are frustrated sometimes by policies and politics, and at times feel disheartened that agriculture isn’t valued in measures equal to what we provide, I have and will continue to press that we must continue to have faith in each other. 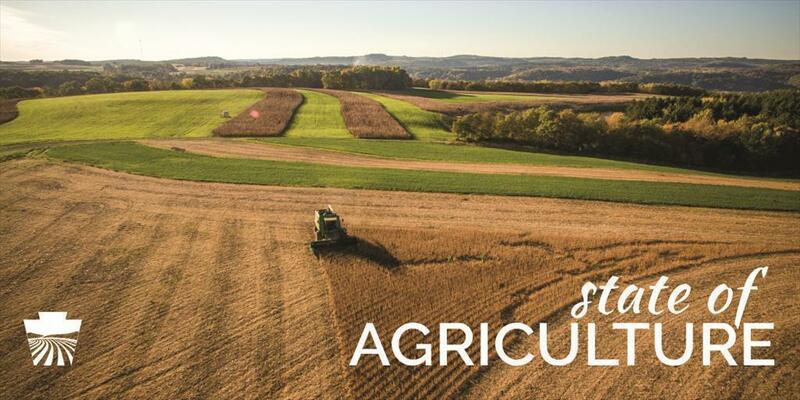 Maintaining a strong, dynamic, forward-thinking, successful agriculture industry in Pennsylvania means we must work together to create and implement new ways to deliver on our promise to consumers. This happens on farms and communities and agribusinesses and in the capital. Adding value isn’t just for commodities. We must all think strategically about what food and agriculture look like as we move forward. The Pennsylvania Department of Agriculture is committed to being your partner in this. My view on our role is to help facilitate the strategic plan for Pennsylvania agriculture. The narrative it contains must come from all of us. The plan will build on the major listening sessions and the themes that we had identified. They include creating a positive environment for agriculture in Pennsylvania, where those in it stay, and those who want to enter agriculture are welcomed; fostering a climate that encourages entrepreneurship and innovation; addressing the urgent need to develop the human capital needs of agriculture so businesses have the workforce to compete and citizens have the skills for success; collectively communicating the industry’s value proposition to society; and translating the role of science in our practices and the benefits to them; and lastly, remembering that our natural resources are finite, and successful production practices, not to mention changing consumer preferences, are going to demand that we continue to improve our conservation and stewardship practices. Moving forward, you will hear more about this planning process and the themes. We know this will take time, and we know that this will be a living document, evolving and changing, to always remain relevant. So the ask that I have of each of you is two-fold. One, I ask you to think about what you want agriculture to look like in Pennsylvania and back home. Number two, what is the one action you can take in your community that could make a difference around agriculture? We have to find where agriculture in our communities is. We have to be bold about those actions, and where we want to go. So in closing, I want to ask each of you to be thinking about the two questions, the two prompts. We need your input. What I’ve tried to do today with the help of the Department of Agriculture, is to sort of lay out some of those issues that we see, that we’re addressing, that each of us are holding as a piece of our work as a part of our community. And I would hope that being here at the Farm Show, and the backdrop of this Farm Show, be a collective reminder of what it is we have as an asset, a great part of our history, and a critical part of the future. But I don’t think it stays here because you and I like it. It’ll stay here by the intentional actions that we take back home, the intentional actions we take as a department and as a government. We need your help to do that. That is the call. We need you to take a hard look at what we’re doing. We will be tested. Some of that test will come by way of our policies, some of it by politics, some of it by budgets, and some of it a big measure will come from changes at the consumer level. How do we respond to that? So, take the two questions I’ve asked you to think about agriculture – what does it look like – and actions you can take, and look forward to continuing the conversation of how it goes into the major themes, how do we bring people into this industry that all of us appreciate as great value to us personally, economically, and certainly to the quality of life here in Pennsylvania. I am very proud of agriculture and proud to serve in this role as Secretary. But I’ve come to appreciate that my role is one of engagement, of listening, of trying to sort through the big issues and make sense of where it is that we go and have a vision for that. But that vision is informed by each of you and the relationship that the industry has with you and the relationship this Department has with you. So thank you very much for being here and I will end where I began: with a simple thank you for what you do, for being part of the public officials, for being in public service, and for all of the stakeholders who are part of this great industry, thank you.